Here is an example of one of our amazing wedding firework displays, a surprise for Premier League footballer Emi Martinez of Arsenal and his beautiful bride Amanda. Watch out for our VIP button and wedding hearts in the sky! Call us on Exeter 01392 338371 to get a quote today. We’d love to help you plan the perfect wedding. We know it can be both exciting and overwhelming with a long checklist of things to be ticked off and numerous options to choose from. Who doesn’t want to get married in a county made up of sandy beaches, fossil cliffs and medieval towns? The trouble here is narrowing down the best venues to choose from. But not to worry because we’ve chosen some of the best locations, which are also perfect for wedding fireworks. Looking to say ‘I do’ in Dartmoor? 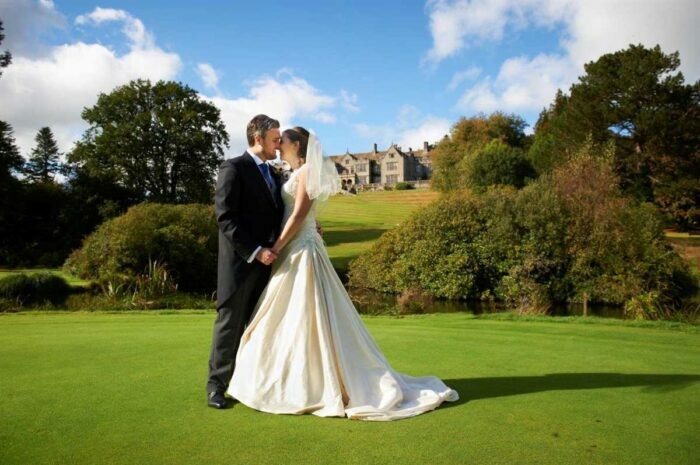 Set in 275 acres of beautiful countryside and rolling valleys, Bovey Castle is a truly unforgettable wedding venue. With its rich history, effortless charm and elegance, you can enjoy a castle wedding like no other at Bovey. Stunning landscaped gardens and period architecture offer the perfect backdrop for wedding photographs. You can also hire exclusive use of the venue, perfect for larger weddings and for the ultimate private wedding. 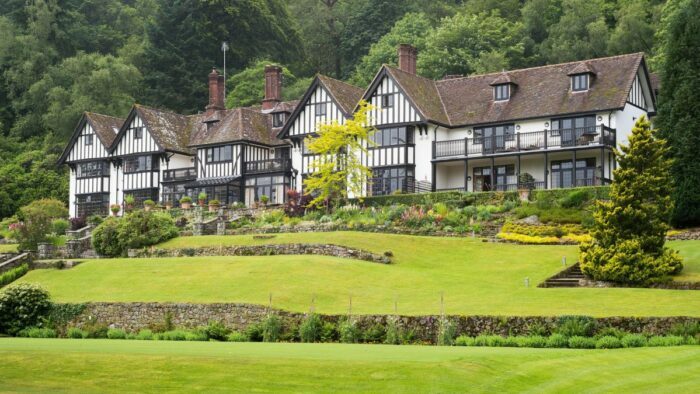 Bovey Castle welcomes wedding fireworks and we are proud to be a preferred supplier. Welcoming guests as if to a private home, Gidleigh Park is an elegant venue for your perfect Devon wedding. Sublime cuisine and the finest wines blend with luxurious guest rooms and a breath-taking setting. From intimate dinner celebrations to lavish banquet-style wedding breakfasts, Gidleigh Park offers everything you need for a stylish wedding. You can choose from our exclusive use package or a day wedding celebration and tailor it to suit your requirements. Your dedicated events coordinator will guide you through the entire process. Another leading venue is Salcombe Harbour Hotel and it doesn’t get much better than this. After a multi-million pound refurbishment, the stylish hotel re-opened with a purpose built function room holding up to 100 guests for the day and up to 120 for an evening reception. The Marine room is licenced to hold civil ceremonies and partnerships and offers breath-taking estuary water views. If you’re after something more intimate, their “Just the Two of Us” package is ideal and has a wonderful, licenced Bedroom Suite on offer. Regardless of the number of guests you have, Salcombe Harbour Hotel will ensure that the big day will go without a hitch. The luxurious Harbour Spa will be available at your convenience to help keep you calm before the ceremony, Here you can enjoy an indoor pool, jacuzzi, sauna, steam room and fitness suite along with 5 treatment rooms. The venue welcomes wedding fireworks as part of their entertainment and recommend Fantastic Fireworks as a supplier. Although it’s very tempting to focus on the venues along the coastline alone when writing about Devon, let’s take a moment to admire the romantic setting of The Two Bridges Hotel. With 60 acres of hotel grounds, the venue is in the centre of Dartmoor National Park, which is famous for its striking granite tors and steep wooded river valleys. The historic and atmospheric building delights with its manicured lawns leafy riverbank. The venue specialises in Civil Ceremonies & Partnerships and can accommodate both small and intimate weddings, and larger, more extravagant weddings of up to 140 guests. The Fountain Room is ideal for smaller ceremonies and its four sets of patio doors it opens on to your own private garden. There is an ornate floodlit fountain – ideal for wedding photographs. However if you have a larger ceremony in mind, the Tors Room is the perfect size. It features beautifully made twinkling gold chandeliers, oak panelling, Georgian ceiling and overlooks the front lawns and River Dart. The Two Bridges Hotel welcomes wedding fireworks and Fantastic Fireworks are proud suppliers of the venue. If noise is a problem at your chosen venue we also offer quiet fireworks as the perfect way not to disturb neighbours and livestock. Colourful roman candles, soaring comets and amazing mines combine to make a beautiful display to match the beautiful bride! Call us today on Exeter 01392 338371 or email [email protected] for friendly and helpful advice.